The Festival of Sukkot begins on the 15th of Tishri, the fifth day after Yom Kippur. It is a huge transition, going from one of the most solemn holidays in our year to one of the most joyous. Sukkot is so joyful that it is commonly referred to in Jewish prayer and literature as Z’man Simchateinu, or the Season of our Rejoicing. 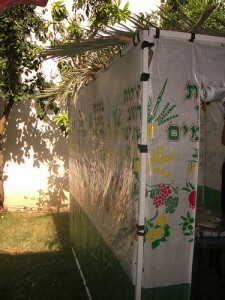 Sukkot is the last of the Shalosh R’galim (three pilgrimage festivals). Similar to Passover and Shavu’ot, Sukkot has a significance that is two-fold, historical as well as agricultural. Historically, the holiday of Sukkos commemorates the 40 year period during which the children of Israel were wandering in the desert, living in temporary shelters. The word “Sukkot” means “booths,” and refers to the temporary dwellings that we are commanded to live in during this holiday in memory of the period of wandering. The Hebrew pronunciation of Sukkot is “Sue COAT,” but is often pronounced as in Yiddish, to rhyme with “BOOK us.” Sukkot lasts for seven days. The two days following the festival, Shemini Atzeret and Simchat Torah, are separate holidays but are related to Sukkot and are commonly thought of as part of Sukkot. No work is permitted on the first and second days of the holiday. Work is permitted on the remaining days. These intermediate days on which work is permitted are referred to as Chol Ha-Mo’ed, as are the intermediate days of Passover.